Short-Sleeved Jackets There are 5 products. 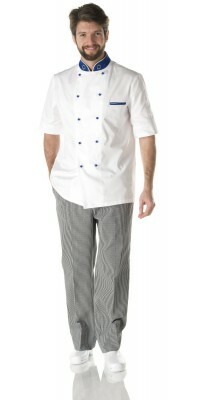 Corbara’s Chef Jacket: choose the practicality of the pure 100% cotton short-sleeved models. 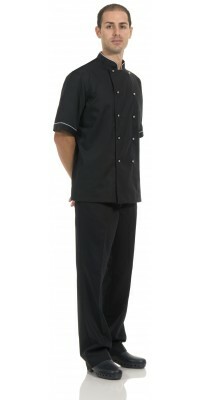 In this section our short-sleeved chef jackets are proposed; they are all made of a cool pure 100% cotton gabardine called Margherita Gabardine, except the Achille Jacket made in cotton and polyester. - the Ettore Jacket, a short-sleeved classic model with plastic fixed (stitched) buttons, for a simple and linear style. - the Loris Jacket, a very comfortable garment with a particular collar made of a blue and white jersey fabric (the same insert of the sleeves), dedicated to those who require both comfort and elegance. 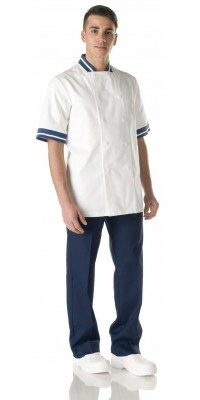 - the Renè Jacket, with royal blue collar and stud buttons and the tricolour outline, dedicated to those who require, even in the short-sleeved jacket, the most elaborate style, typical of the long-sleeved ones; to this garment is matched the Renè Apron, in the same colour of the jacket with the same name, made of wrinkle free 100% pol. Gabardine Plus. The series is completed by the Achille Jacket, modern variant of chef's jacket with short sleeves and classic buttoning, made of 50% cot. 50% pol. “cotton on the skin” Comfort Satin. Short-sleeved jacket, model Achille "cotton on the skin", Black colourSilver pull-out buttons Immediately available for delivery: sizes from S to XL Made of Comfort Satin, 50% Cot., 50% Pol. 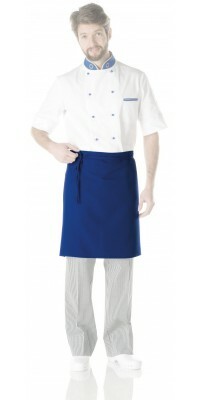 Chefs' apron model René Royal Blue coloursize cm 55 x 70Made of Gabardine Plus, 100% Pol.